Blog Hop your way into Thanksgiving with daily doses of inspiration. Beginning Monday, November 17, nine women bare all to bless others. Join us in reading inspiring stories of finding joy, living your purpose, overcoming death, triumphing over infertility, healing from spousal abuse, rising above financial loss, raising autistic children, living with chronic pain and overcoming the hard stuff by finding God in the details. Share in stories of triumph and encouragement and being thankful no matter what. An article about being thankful will be released on each Bloggers websites on their assigned day. Searching for a step by step guide to navigate the grieving process of losing a loved one is common. The pain is so deep that we want to know there is an end to it. Unfortunately there is no secret formula for walking though grief but Julie from Loving Life Ministries has learned how to heal and wants to share how with others. 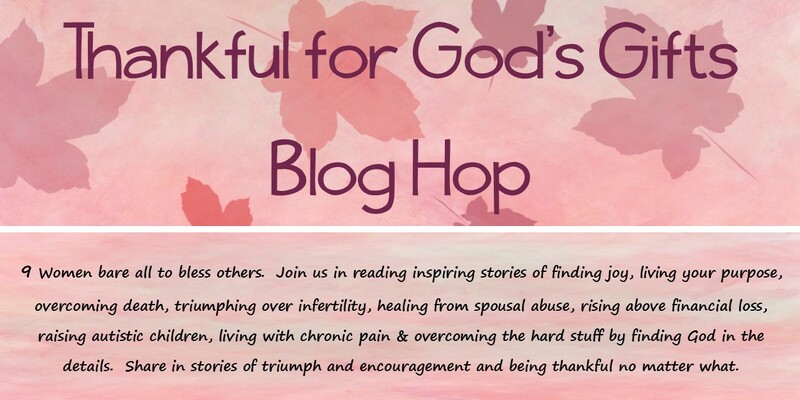 Part of the Thankful For God’s Gifts Blog Hop. After 4 years of not being able to conceive this mother never lost her faith. God rewarded her faith by telling her twice that she would give birth and finally she was blessed with a baby girl. Come read her beautiful story of hope and love. Part of the Thankful For God’s Gifts Blog Hop. Imagine what it would be like to meet the pastor that led you to Jesus 38 years later. Then imagine sitting down with him to write his life story. Today’s post is a powerful and moving testimony. Sometimes God’s best gifts are showing us His big picture of how our lives intertwine. Part of the Thankful For God’s Gifts Blog Hop. When Joyce got away from her abusive husband after 2 years she still had struggles ahead as she raised her 2 sons as a single mother. Good thing God was there each step of the way and 10 years later her life is full of Joy. God really shows up in the details as you will read on Joyce’s blog today. Part of the Thankful For God’s Gifts Blog Hop. Embracing our talents is one thing. Discovering how to use those talents to serve others and to glorify God is what life is all about. When we acknowledge that our skills are gifts from God he blesses us more that we can imagine. Just ask wedding photographer and Christian blogger Jane Reed. Part of the Thankful For God’s Gifts Blog Hop. Living with chronic pain can sometimes leave you feeling you have little to be thankful for. Where are the gifts in the fog of hurting all the time? Come read the eloquent words of Donna Stone as she encourages others in her shoes. Part of the Thankful For God’s Gifts Blog Hop. Sister We Thrive: Sister, given any thought to being thankful? Well, I have. Often we run to God with our problems and worries. We forget that to enter into His presence we need to start with being thankful. Come get an inspirational does of being thankful for God today on the Sister We Thrive Blog. Part of the Thankful For God’s Gifts Blog Hop. Sometimes we all need to be reminded that God chose us to be our child’s mother. It was a divine appointment to have our unique child assigned to us. We need to be built up in the confidence that we have the exact skills and experiences required to meet our child’s needs. Melinda Bennett mother of 3 (2 with autism) reminds us of this very thing today on her blog Completely Committed. Part of the Thankful For God’s Gifts Blog Hop. These days many are getting by with less. We have gone from excess of funds to scarcity of funds in the last 6 years due to economic changes. But perhaps getting by with less is a gift from God. Maybe our daily bread is enough and it’s time to give to others. Part of the Thankful For God’s Gifts Blog Hop. Next Where is my RSVP?